Eric`s Angling Tackle Shop Erics Angling offer fantastic prices on a vast range of fishing product including Carp Rods, Carp Reels, Bedchairs and Chairs, Sleeping Bags, Bite Alarms and much much more. baxfarm.co.uk Bax farm fishery is in Tonge in the Garden of England, namely Kent, and consists of 4 lakes and a small river all set in a peaceful country farm estate. The lakes hold a good head of carp and for the real carp fisherman there is the specimen lake where you will get carp up to 28lb. The other lakes all hold carp up to 10lb so these can be a great starting point for anyone wanting to try their hand at carp fishing. Broadlands Fishery Hill Street, Calmore, Southampton. SO40 2RX The main lake is over 26 acres filled with Carp coming out over 31lb, Pike in excess of 30lb, Bream in excess of 14.5lb with a good mixture of Tench, Rudd, Perch & eels over 10lb. Bury Hill Fishery Old Bury Hill,Westcott, Nr Dorking, Surrey RH4 3JU. Surrey’s Premier Coarse Fishery.Part of a 200-year-old estate set in a beautiful, secluded valley in the heart of the Surrey Hills, Bury Hill Fisheries near Dorking is one of the finest day ticket fisheries in the UK. The UK`s number one online carp angling guide..!! Carp-Forums.com Carp Forums is a great site offering lots of information and competitions and once logged on as a member you can post information and ask questions of all the other members with regard to rigs, baits etc. well worth a visit !! They are two female carp anglers who have devoted their lives to their passion for fishing. They spend as much time as possible on the bank in all weathers, seeking the chance of there landing mat being graced by a beautiful carp. The challenge of pitting their skill and wit against the most wary of carp is something only like-minded carp anglers share. They spend the briefest of moments with their quarry but appreciate their individual beauty and the limited time they have with them before slipping them back to their watery home. Borwick Lake Carnforth Lancashire LA6 1JU Borwick Lake is a very mature gravel pit. Originally dug out for the m6 in the 70's/80's and stocked in the late 80's. The lake has matured into a well established Carp Lake. Cellars Clough Fishery Marsden, Huddersfield, West Yorkshire. Churchgate Lakes Battlesbridge Essex. Set amidst a stunning 20-acre estate the fishery is comprised of three lakes, each heavily stocked with large fish and a diverse range of species. The complex boasts an impressive anglers lodge which has panoramic views over the surrounding countryside. Offering the perfect environment to socialise and catch up on all the latest captures. Cromwell Lake is a beautiful 18 acre spring fed, tree lined specimen lake, set in peaceful surroundings just of the A1 in Newark. The Lake has many features and varies in depths between 3ft and 18ft, with prominent gravel bars, silty areas and drop off’s, there are various types of weed in the warmer months, but every peg is fishable and this contributes to the size and health of our fish by supplying a rich natural food source. Cudmore is a Long Established, Clean and Sustainable Coarse Fishery. Located in north Staffordshire, set in the Heart of a Country Estate & Close to the M6 Motorway Junction 15. You will soon lose yourself amongst Cudmore's Beautiful Scenery, Wildlife & Tranquil Surroundings. Competitions and Events are held all year round, and they are Recognised as one of the Countries leading Match & Pleasure Venues. 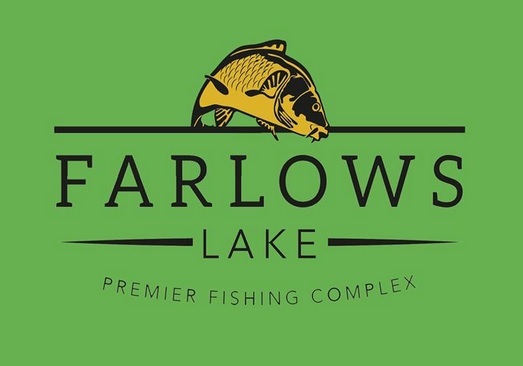 Farlows Lakes Farlows lake is steeped in Carp fishing history as one of the original gravel pits of the Colne Valley. We have some of the UKs finest, dark & scaley specimen Carp. Fisheries.co.uk Links to over 90 day-ticket, match and holiday coarse and game angling venues which offer a variety of fishing on over 350 different lakes, pools and stretches of river. Fish South East If you love coarse fishing and live in or are visiting the South East corner of England, this site is for you. Fish South East will show you where to fish with detailed venue guides. 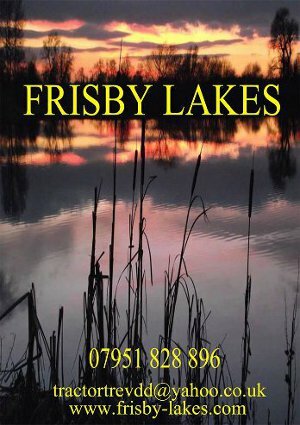 Frisby lakes is a 100 acre site consisting of two mature gravel pits, (36 acres & 16 acres) and a stretch of the River Wreake. Frisby lakes operate on an open day ticket basis with limited season permits including night fishing. The waters hold specimen Carp, Zander, Pike, Tench, Bream, Roach, Perch and Chub. Hunters Lodge Day Ticket Fishery consists of two 1.75 acre lakes, set in stunning scenery deep in Sussex woodlands between Crawley and East Grinstead. The location is very secluded and you will be enchanted by its beauty and tranquillity. Marshside Fishery, Chitty Lane, Marshside, Nr Canterbury Kent. The two lakes cover an area of 7.5 acres with a combined total of 60 swims. The banks behind the swims allow plenty of room for overnight camping to accommodate night fishing. In addition, there is ample car parking and regularly-maintained toilet facilities. 15th century Tudor Manor House with a moat, beautiful gardens and over 100 acres of grass and woodland with four superb fishing lakes surrounded by unspoilt countryside. Recently fully refurbished Newland Hall is a premier wedding venue catering for exclusive wedding ceremonies and receptions. Nuddock Wood Lake Specimen Fishery is an 8.6 acre, mature, tree lined syndicate lake in Burringham, North Lincolnshire. The main lake has 13 newly constructed, carp pegs and they are in the process of installing power and Wi-Fi on every peg. Old Mill Lakes is set overlooking the beautiful Lincolnshire Wolds in a peaceful, secure and friendly environment and offers excellent angling for well looked after, clean and healthy carp. Old Mill Lakes also offers access to toilet and shower facilities. The Warren Fishery comprises of three very different lakes which can be fished on a Day Ticket, Season Ticket or Membership. There is also a fourth lake for Members and Season Ticket holders only. UK Fisherman.com UK Fisherman is committed to bringing you the best of all things fishing and is always delighted to exchange links with other quality fishing related sites. Carp Fishing in France, located in upper Normandy, VALLEELAKES 1&2 are set in stunning locations close to the three major ferry ports of Dieppe, Bolougne and Calais, the closest being only an hour away. Wyreside Lakes is a family run business, situated in over 120 acres of farmland at the foot of the Bowland Fells in Dolphinholme Lancashire.On the estate there are 7 fishing lakes - with a superb stocking of coarse and pike.